They will disappear in a snap! Let's not kid ourselves, making cheesecake from scratch is no easy task. 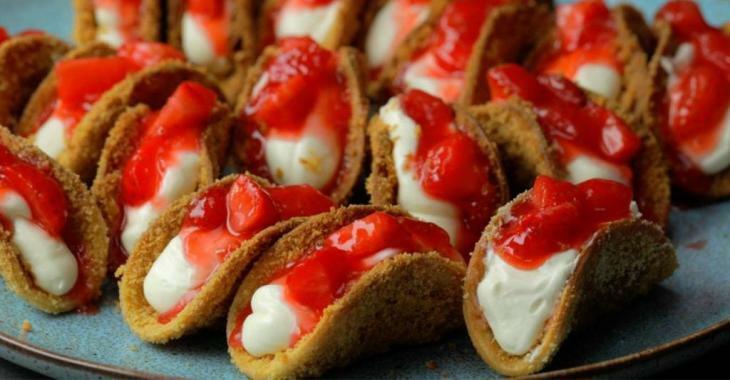 That's why, today, we're offering you these strawberry cheesecake bites you can make in just 30 minutes! Ideal for your next potluck or a party with friends, this dessert will disappear in a snap; impossible to eat just one! 1.Preheat the oven to 400°F while preparing the recipe. 2.In a first bowl, pour the melted butter. In a second bowl, pour crushed graham crackers. On a flat and clean surface, spread the tortillas. 3.With the outline of a round glass or cookie cutter, cut out 4 to 5 circles in each tortilla, for a total of 20 circles. Dip the pieces of tortillas in the melted butter, then coat them with crushed Graham biscuits. 4.Flip a muffin tin upside down. Place the pieces of tortillas between the muffin compartments. Bake 10 minutes until golden. Remove the pan from the oven and let cool. 5.Meanwhile, whisk together the cream cheese, powdered sugar, lime zest, vanilla and 35% cream until peaks form. Refrigerate for about 30 minutes. Then transfer to an icing pen. 6.Prepare the strawberry filling. In a small saucepan, combine the strawberries, 1 teaspoon of water and the sugar. Bring to a boil then reduce heat and simmer until strawberries are softened. 7.In a small bowl, add 1 tablespoon water to the cornstarch, then mix until a it is you obtain a smooth mixture. Pour into the saucepan and bring to a boil. Mix and remove from heat to cool completely. 8.Divide the cheesecake mixture between the tortilla cups. Then add 1/2 teaspoon of the strawberry mixture on top. Sprinkle with crushed graham crackers, transfer the bites to a serving platter and enjoy! Note: This recipe for strawberry cheesecake bites gives about 6 servings.